Not pictured: Ryan Gosling doing a keg stand. Since winning an Oscar for writing Juno (a film which I thought was terrific and still like very much), Diablo Cody has had a pretty rough couple of years. Her follow-up, Jennifer's Body, was a trashy bit of fluff that was duly trashed by critics and was stillborn at the box office, and her frequently brilliant television series The United States of Tara was unceremoniously cancelled after three seasons. It's not difficult to see Young Adult, which re-unites Cody with her Juno director Jason Reitman, as Cody's response to the last few years. In moments when Mavis Gary (Charlize Theron) talks about the cancellation of the series of young adult novels that she has spent over a decade ghostwriting, it certainly feels as if Cody is working out some of her own issues. Yet Young Adult is far from a solipsistic attempt by a writer to air their grievances, but an entertaining, if melancholy examination of the depression and malaise that emerges when someone realises that they aren't living up to the dreams of their youth. Whilst struggling with writer's block as she tries to write the last entry in the formerly successful Waverly Place series, Mavis receives an e-mail from her ex-boyfriend, Buddy (Patrick Wilson) containing a picture of his newborn child. This causes Mavis to start contemplating her past and just why Buddy would send her the e-mail in the first place. She eventually decides that he sent it to her because he is desperately unhappy, so Mavis decides to head back to her hometown of Mercury, Minnesota to "rescue" Buddy from his cosy family life. As that beautiful piece of self-obsessed logic shows, Mavis Gary is a wonderfully monstrous figure. A walking mass of narcissism and bitter resentment aimed at no one and everyone, Mavis still thinks and acts like the spoilt popular girl that she was in high school. (If the way she treats everyone around her weren't proof enough, the film uses excerpts from the book Mavis is working on, the central character of which is an obvious surrogate for Mavis, to indicate just how she views the world.) Vain, catty and relentlessly cruel, Mavis carries herself with an air of entitlement that suggests that Buddy should be hers just because she wants him, and because he reminds her of a time when she felt like she had a future to look forward to, rather than a present that makes her unhappy and a past to regret. Theron gives a career-best performance as Mavis, maintaining that level of bile for pretty much the entirety of the film, only letting the mask slip at key points for maximum effect, but remaining solidly hilarious throughout thanks to her pitch-perfect delivery of each passive-aggressive (and just aggressive-aggressive) barb. The person at the receiving end of most of those barbs is Matt Freehauf, a former classmate of Mavis' who was badly beaten by jocks who thought that he was gay, sparking a national outrage that died down as soon as everyone realised that he wasn't. 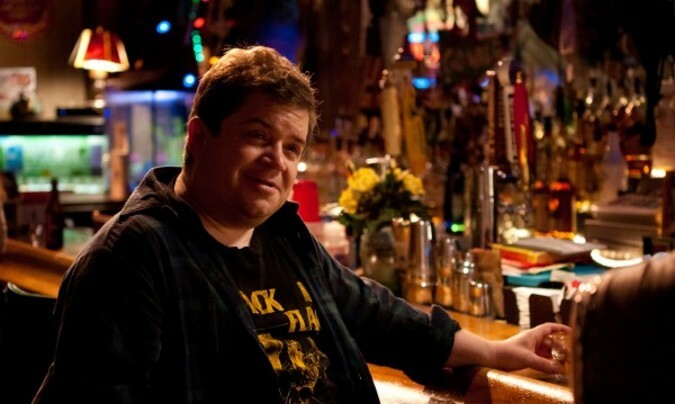 Whilst casting geek icon Patton Oswalt as a pudgy Star Wars nerd may seem like an obvious choice, Oswalt gives Matt a soulful quality that makes the character much richer than if he had been played as a stereotypical nerd. As the one person that Mavis tells her Buddy-stealing plans to, Matt tries his best to convince her of the wrongheadedness of it all, but never actually does anything substantial to stop her because, deep down, he's still the kid who idolised girls like Mavis at high-school. You really feel that Matt holds back because he doesn't want to lose the shared secret that allows him to finally hang out with the most popular girl in school, even though they graduated nearly twenty years ago. Much like its characters, Young Adult is obsessed with the past, though unlike them it does not fetishise it.The use of '90s music like The Concept by Teenage Fanclub, which soundtracks the opening titles and plays an important role in one scene of the film itself, could lead some to mistake it for a wallow in nostalgia, especially when one character actually says, "The '90s were awesome." In fact, it's a film about the dangers of getting lost in memory. Mavis' state of arrested development comes from never having to deal with a real crisis, and the story is kicked into action by her desire to return to a sense of safety when faced with something as daunting as no longer having the security of her YA series. It's a story tinged with sadness and regret, one that is not easily resolved but manages to be hugely entertaining along the way. The small scale makes it seem very slight, but anyone who has every wondered where exactly their life is going will find much to appreciate in Young Adult.